Soledad Sigh-Sighs draws on experiences shared by many children—coming home alone, creating imaginary friends, and the benefits and disadvantages of being an only child. 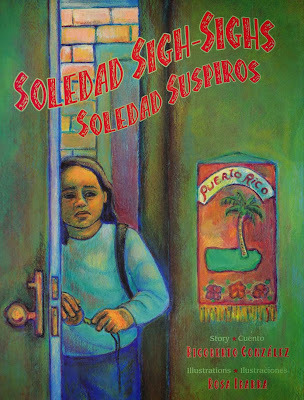 The rich Puerto Rican backdrop—the food, the decorations in Soledad’s home, the Spanish terms that the girls sprinkle into their English, their joy in drawing the Puerto Rican flag—add depth to a story that all children can relate to. As an elementary school teacher, I also like reading books about children from diverse cultural and linguistic backgrounds that don’t dwell exclusively on language and culture—Soledad is a little girl struggling with a common childhood problem, and she just happens to be Puerto Rican. It’s also refreshing that Soledad’s family—despite their absence from this story—is portrayed as deeply caring. So many children grapple with having parents whose work means they can’t always be there. Stories like this give kids a reassuring and relatable parallel. Ibarra’s pastel and colored pencil illustrations, on a palette of mostly oranges and blues, are both bright and warm. The dominance of primary colors—from the children’s clothing to the buildings—subtly reflect a warmth that evinces both Soledad’s loneliness when she’s by herself and her joys when she’s with her friends. In English, the use of onomatopoeias—Soledad’s sigh-sighs, the broom’s sweep-sweep, the swing’s screech-screech—gives the story a simple and compelling rhythm. Unfortunately, while the Spanish translation generally reads well, this pattern is lost. Soledad’s sigh-sighs become alternately “Soledad suspira que te suspira” or “Soledad suspiros,” and similar things happen with some of the other onomatopoeias. The girls’ dialogue in the English version reads realistically as mostly English with some code switching into Spanish, which helps flesh out the girls’ characters as Puerto Ricans living in New York and validates the ways that many Latinos in the US mix languages at home. However, in the Spanish version, this is also lost. I like that the poetry in the play on words of Soledad (“loneliness”) and her imaginary sister Felicidad (“happiness”) works in both languages. There are some odd copyediting problems, though (hecha una carrera instead of echa una carrera). Soledad Sigh-sighs / Soledad suspiros is fertile ground for classroom discussions. There’s plenty to talk about—great dialogue, multiple characters with subtle distinguishing traits, realistic feelings, longings, and confusions. For kids facing some of the same issues as Soledad, this book could offer a comforting connection, and, for all students, it’s a window into the life of a young girl who just might remind them of someone they know. Highly recommended.